It is famous for posting the first stamp in the world. It happened in this historic building on 2 May, 1840. The stamp`s name was Penny Black. In the museum there is an old post office, a collection of stamps, a film room, a tea room and a children`s activity room. 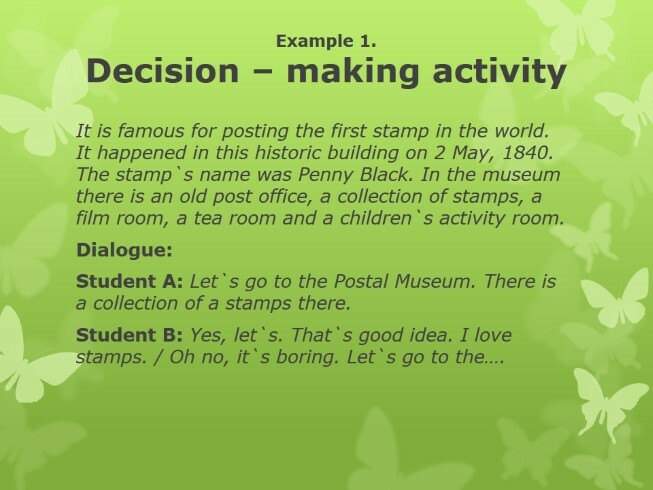 Dialogue: Student A: Let`s go to the Postal Museum. There is a collection of a stamps there. 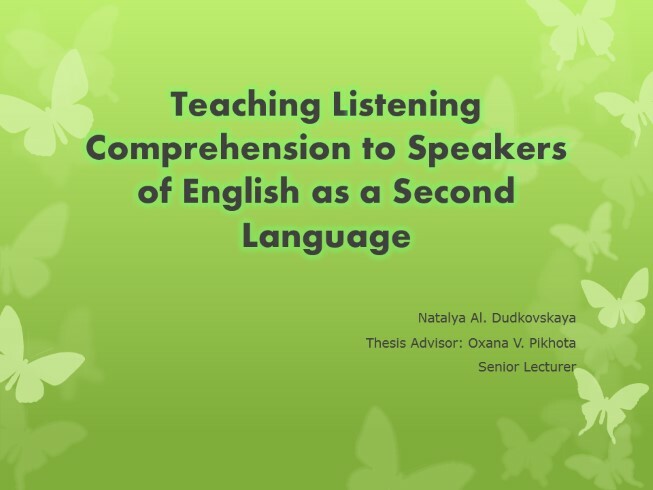 Student B: Yes, let`s. That`s good idea. I love stamps. / Oh no, it`s boring. 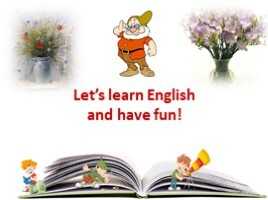 Let`s go to the…. 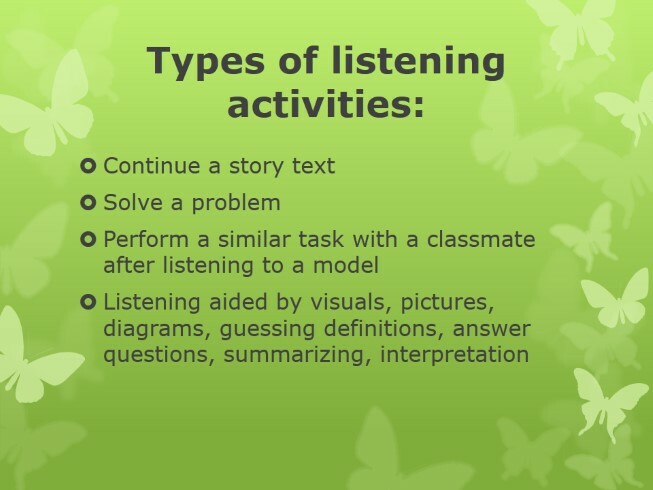 This activity begins with students hearing a poem. 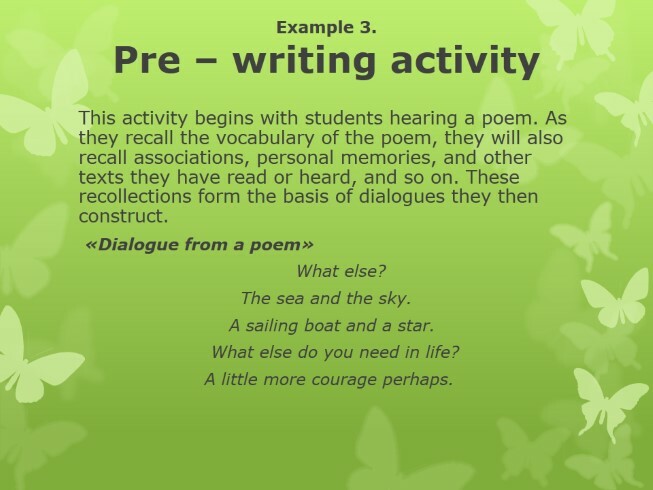 As they recall the vocabulary of the poem, they will also recall associations, personal memories, and other texts they have read or heard, and so on. These recollections form the basis of dialogues they then construct. «Dialogue from a poem» What else? The sea and the sky. A sailing boat and a star. What else do you need in life? A little more courage perhaps. Step 1. Read the poem once. Afterwards, students write down any words they remember. Step 2. 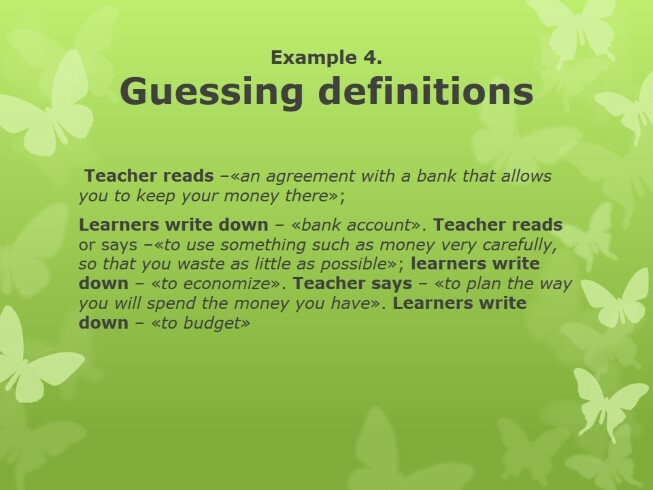 Students look at each other`s world lists. If they see a world they recall hearing but didn`t write, they add it to their list now. Step 3. Form groups of three or so. 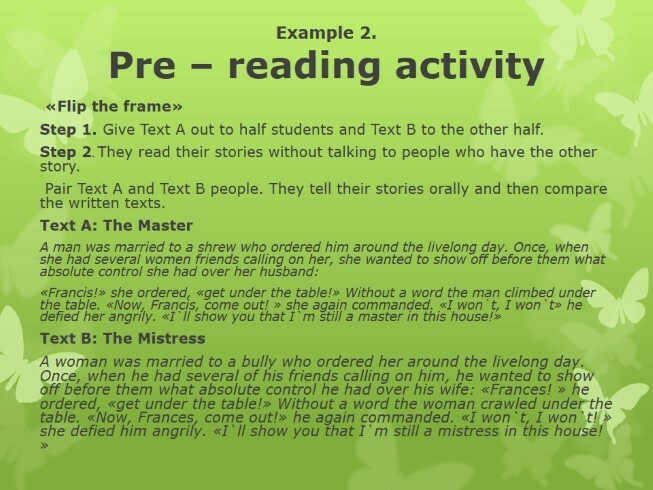 Ask the students to produce a single sheet on which the words they heard are put either under the heading «he» or under the heading «she». Step 4. Using only words and phrases from these two pools, each group composes a «he» – «she» dialogue that expresses what they understood of mood, feelings and relationship. Each group member makes a copy. Step 5. Form pairs and swap papers around. Step 6. 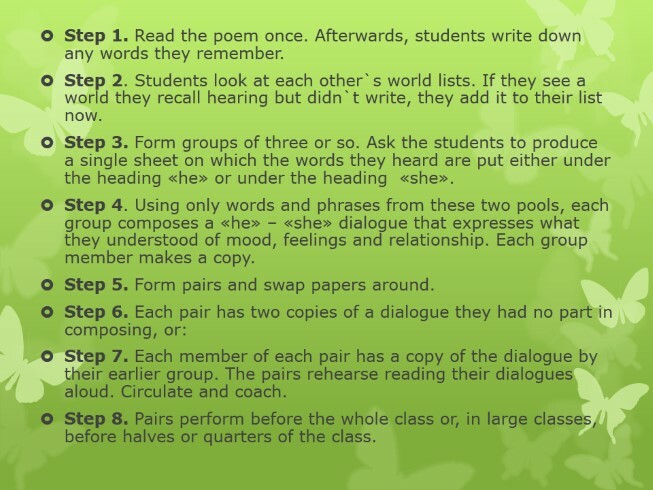 Each pair has two copies of a dialogue they had no part in composing, or: Step 7. Each member of each pair has a copy of the dialogue by their earlier group. The pairs rehearse reading their dialogues aloud. Circulate and coach. Step 8. Pairs perform before the whole class or, in large classes, before halves or quarters of the class. Step 1. 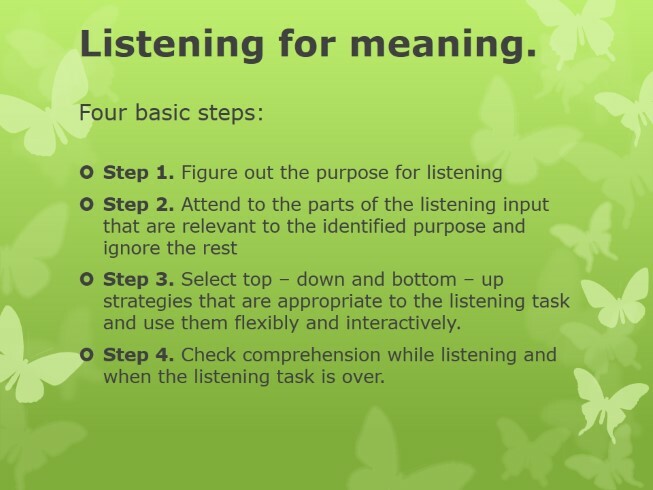 Figure out the purpose for listening Step 2. 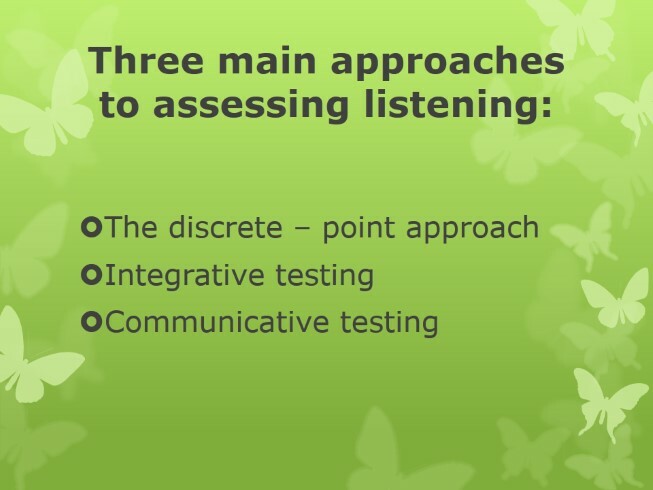 Attend to the parts of the listening input that are relevant to the identified purpose and ignore the rest Step 3. 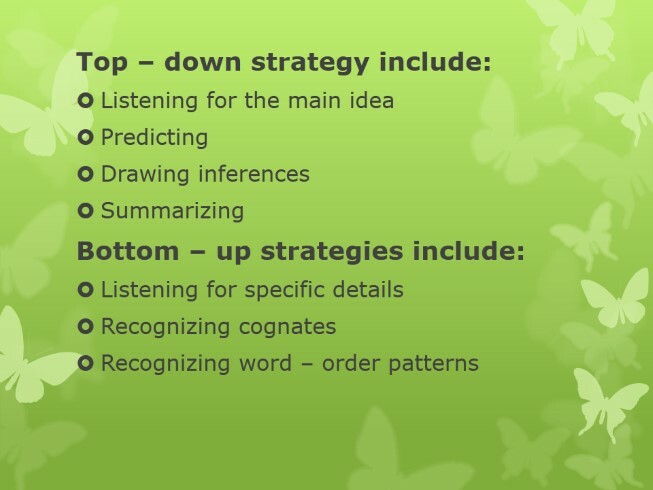 Select top – down and bottom – up strategies that are appropriate to the listening task and use them flexibly and interactively. Step 4. 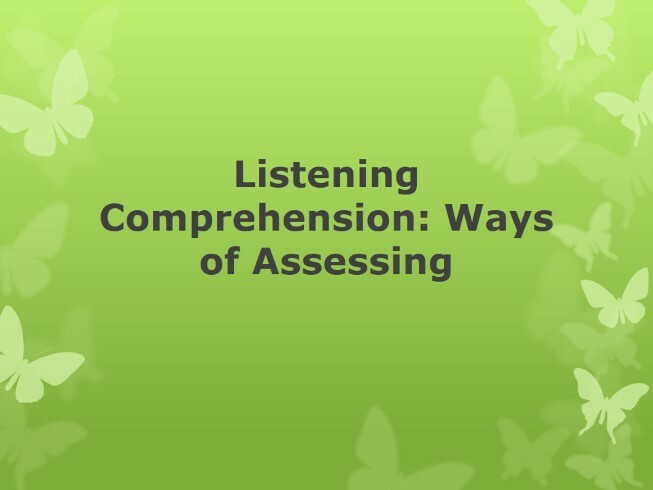 Check comprehension while listening and when the listening task is over. 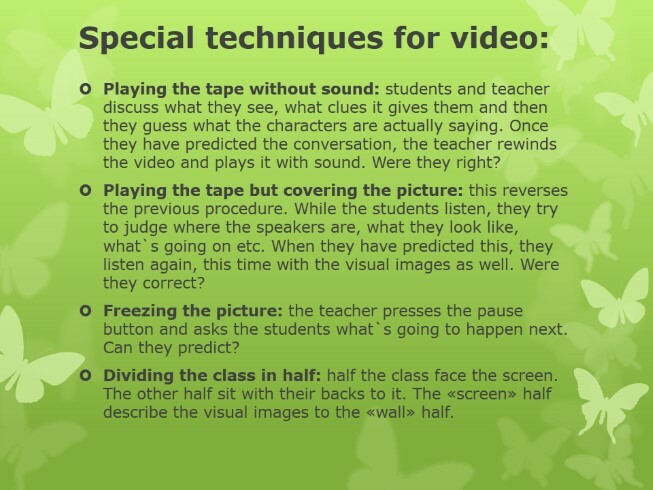 Playing the tape without sound: students and teacher discuss what they see, what clues it gives them and then they guess what the characters are actually saying. 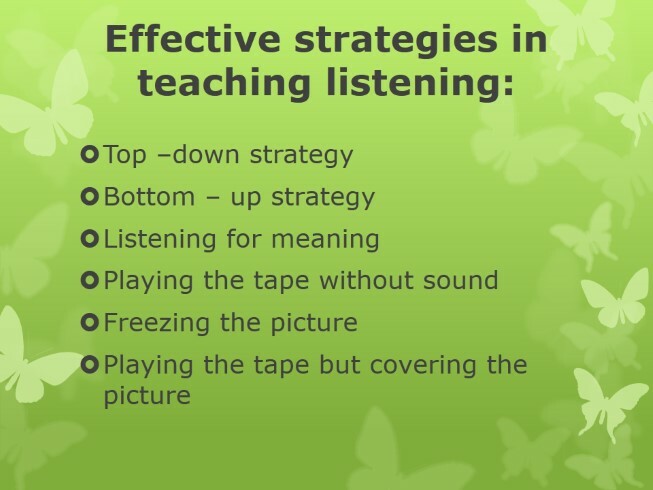 Once they have predicted the conversation, the teacher rewinds the video and plays it with sound. Were they right? Playing the tape but covering the picture: this reverses the previous procedure. While the students listen, they try to judge where the speakers are, what they look like, what`s going on etc. When they have predicted this, they listen again, this time with the visual images as well. Were they correct? 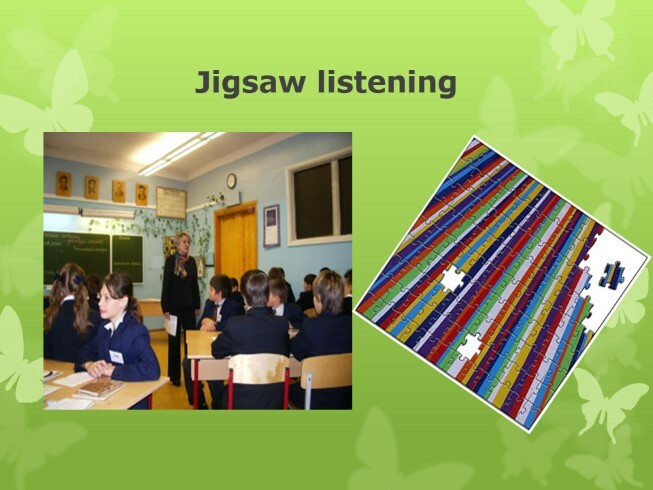 Freezing the picture: the teacher presses the pause button and asks the students what`s going to happen next. Can they predict? Dividing the class in half: half the class face the screen. The other half sit with their backs to it. The «screen» half describe the visual images to the «wall» half. Where does Computery live? What games does he play? How often does he play? When does he start? Why does he play chess? I`m Computery. I`ve got a brother Compi and a sister Compa. We live in Computertown. Compi and Compa like playing computer games and darts. 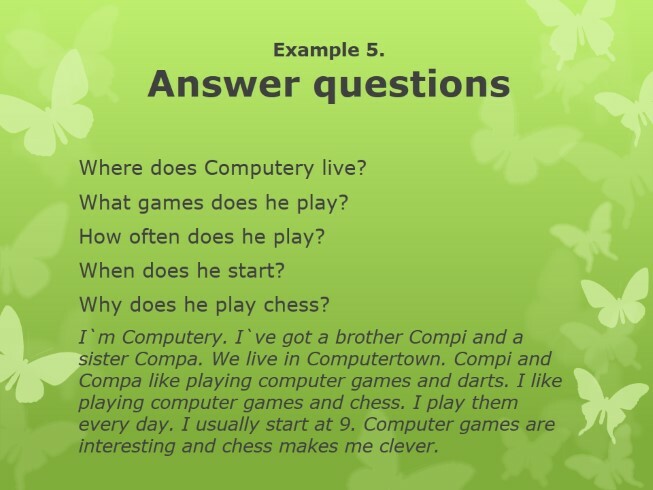 I like playing computer games and chess. I play them every day. I usually start at 9. Computer games are interesting and chess makes me clever. Original: After we'd seen the film, we felt so disturbed we just couldn't go to bed. Paraphrase : That film was so exciting we couldn't sleep after it. Original: So we sat up talking about it until 3.0 a.m. Paraphrase: We went on discussing it until three in the morning Original: I mean, makes you wonder, a film like that. Paraphrase : Films like that make you think about things. or: Original: Jackie, what's the time? Paraphrase: He asked Jackie what the time was. Original: Five, I think. Paraphrase: She said she thought it was five o'clock. Original: Well, come on then, let's go. Paraphrase: He said they had to go. Original: Where to? Paraphrase: She asked where they had to go to. Take a skipping rope. Skip! Oh! 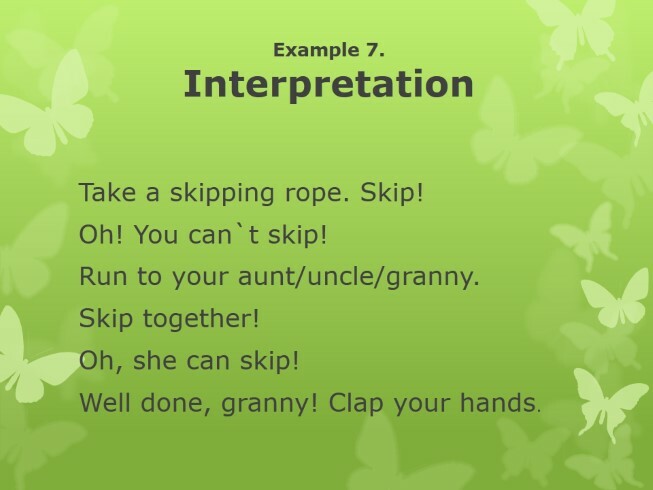 You can`t skip! Run to your aunt/uncle/granny. Skip together! Oh, she can skip! Well done, granny! Clap your hands. Example 8. 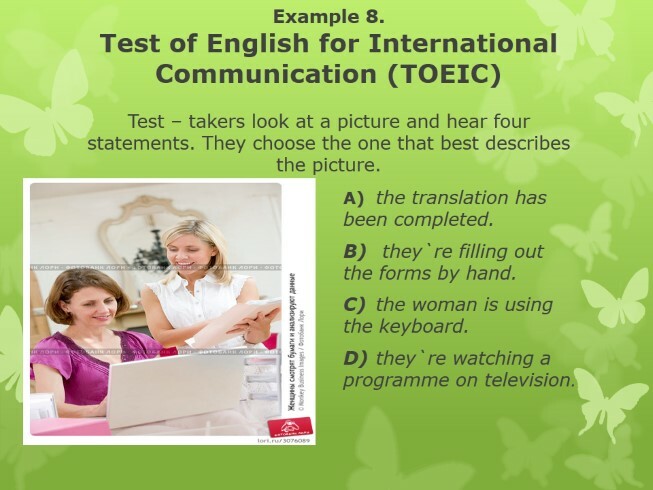 Test of English for International Communication (TOEIC) Test – takers look at a picture and hear four statements. They choose the one that best describes the picture. A)	the translation has been completed. B)	they`re filling out the forms by hand. C)	the woman is using the keyboard. D)	they`re watching a programme on television. A) her work hours have been cut. 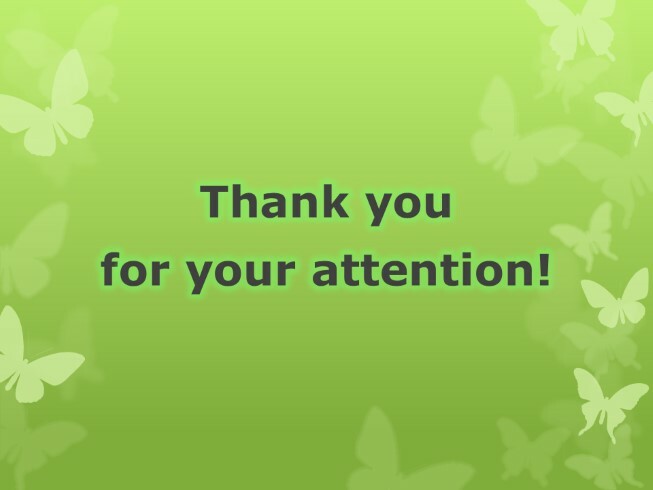 B) she`s finished clipping out the article. C) there`s not much air in this room. 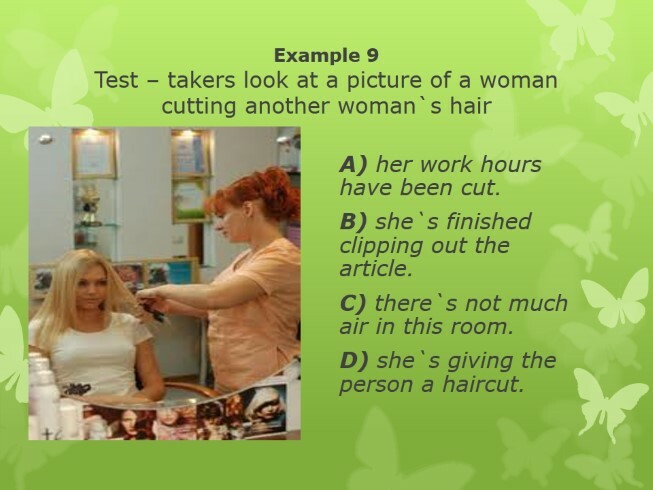 D) she`s giving the person a haircut. 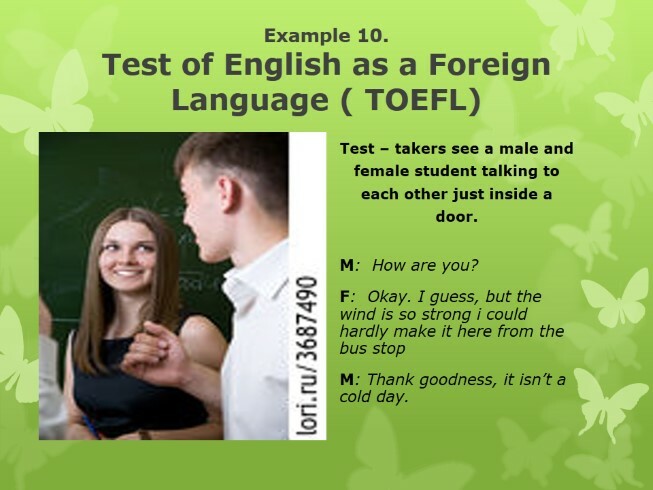 Test – takers see a male and female student talking to each other just inside a door. M: How are you? F: Okay. I guess, but the wind is so strong i could hardly make it here from the bus stop M: Thank goodness, it isn’t a cold day. Example 11. 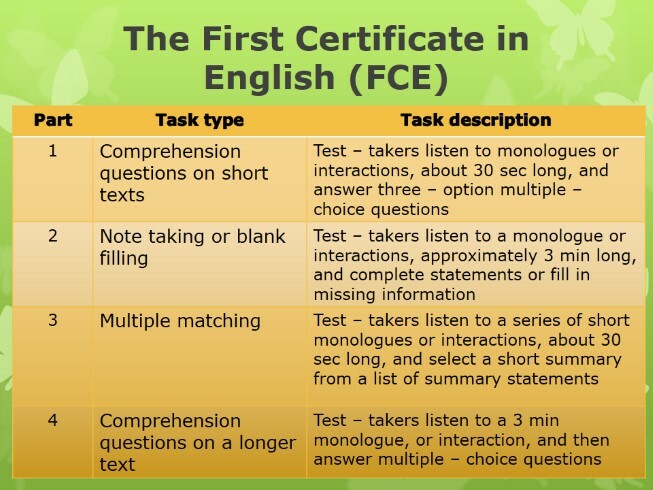 Test – takers hear and read the question, read the options, and reply. Q 1. 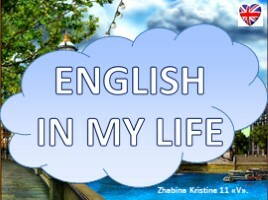 What does the man imply? (a)The woman should not be out of breath. (b)The weather could be worse. (c) The bus must have been late. 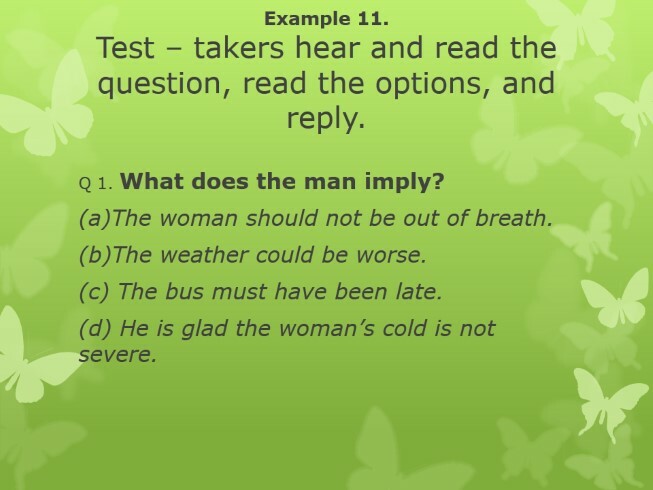 (d) He is glad the woman’s cold is not severe. Example 12. 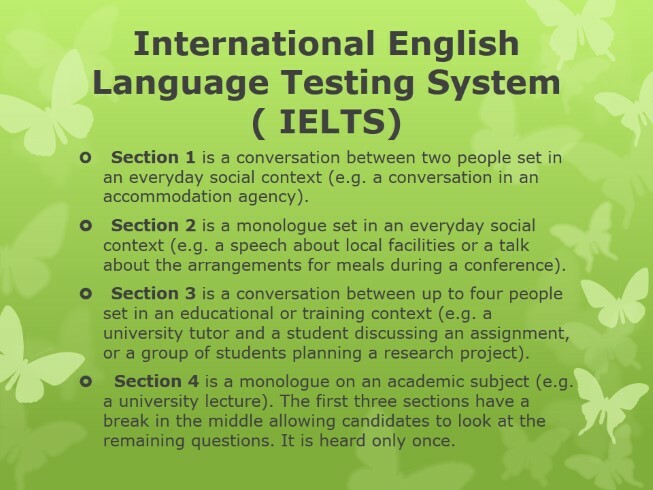 Test – takers see a picture of a male and female student sitting in a lounge. M: Tina’s doing much better in her biology class isn’t she F: Yes she’s really come a long way. Example 13. 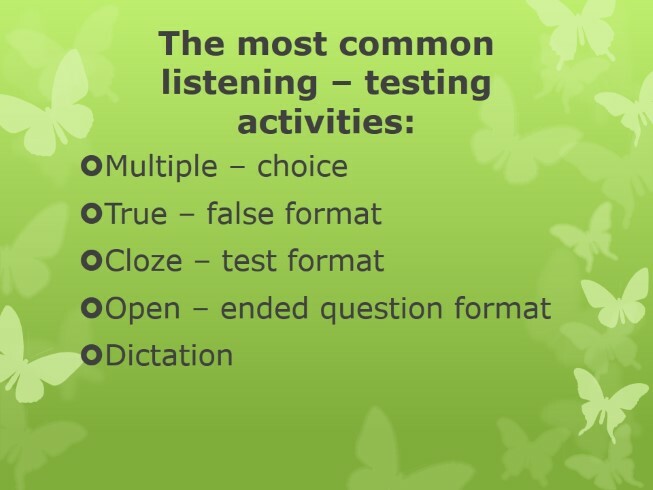 Test – takers hear and read the question, read the options, and reply. Q 2. What does the man say about Tina? (a) She has made a lot of progress. 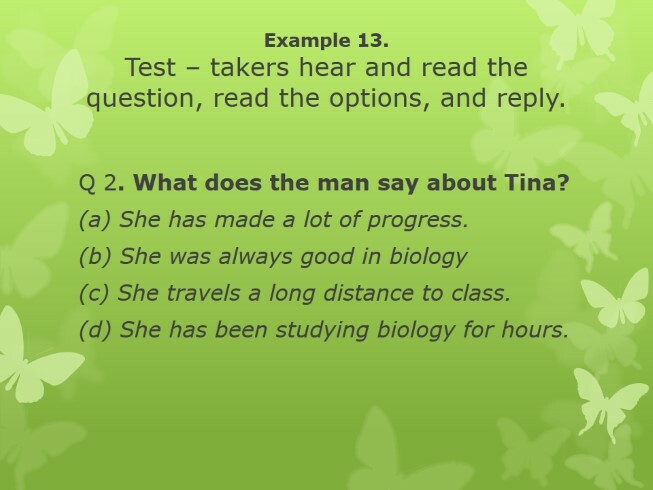 (b) She was always good in biology (c) She travels a long distance to class. (d) She has been studying biology for hours. 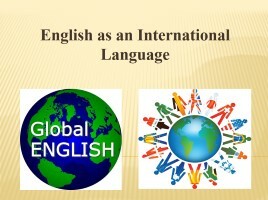 Section 1 is a conversation between two people set in an everyday social context (e.g. a conversation in an accommodation agency). 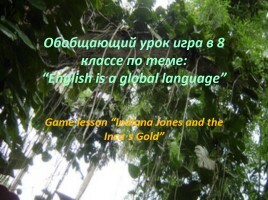 Section 2 is a monologue set in an everyday social context (e.g. a speech about local facilities or a talk about the arrangements for meals during a conference). 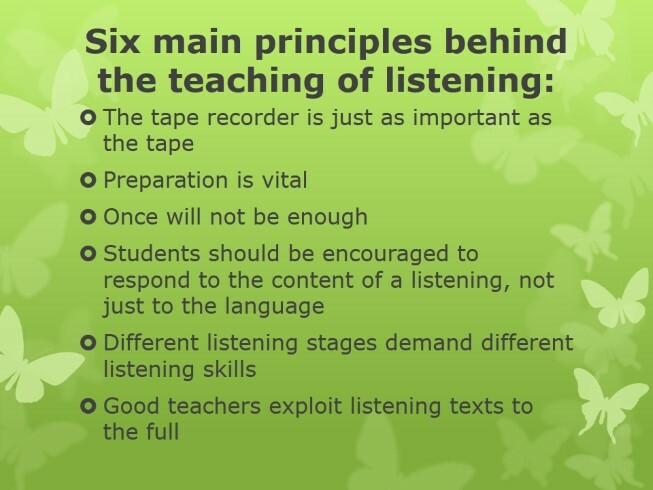 Section 3 is a conversation between up to four people set in an educational or training context (e.g. a university tutor and a student discussing an assignment, or a group of students planning a research project). 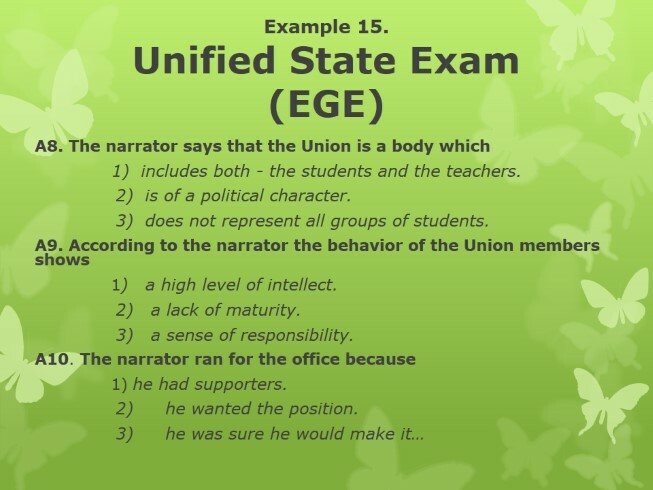 Section 4 is a monologue on an academic subject (e.g. 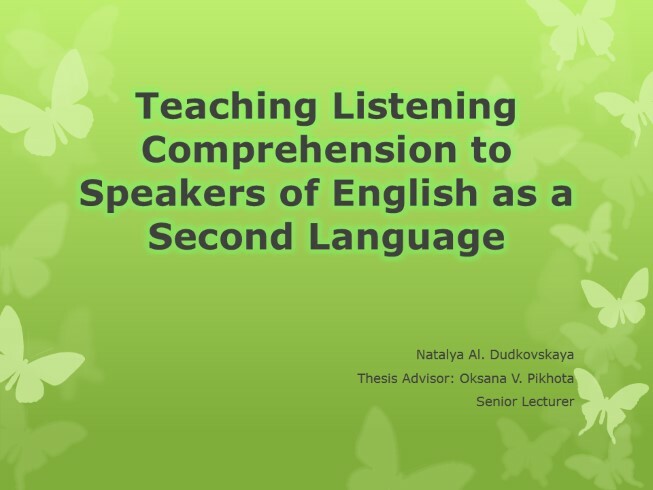 a university lecture). The first three sections have a break in the middle allowing candidates to look at the remaining questions. It is heard only once. 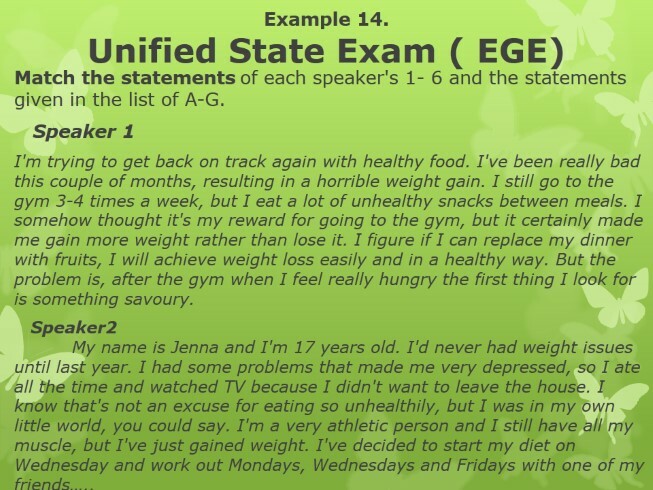 Match the statements of each speaker's 1- 6 and the statements given in the list of A-G. Speaker 1 I'm trying to get back on track again with healthy food. I've been really bad this couple of months, resulting in a horrible weight gain. I still go to the gym 3-4 times a week, but I eat a lot of unhealthy snacks between meals. I somehow thought it's my reward for going to the gym, but it certainly made me gain more weight rather than lose it. I figure if I can replace my dinner with fruits, I will achieve weight loss easily and in a healthy way. But the problem is, after the gym when I feel really hungry the first thing I look for is something savoury. Speaker2 My name is Jenna and I'm 17 years old. I'd never had weight issues until last year. I had some problems that made me very depressed, so I ate all the time and watched TV because I didn't want to leave the house. I know that's not an excuse for eating so unhealthily, but I was in my own little world, you could say. I'm a very athletic person and I still have all my muscle, but I've just gained weight. I've decided to start my diet on Wednesday and work out Mondays, Wednesdays and Fridays with one of my friends…..
A. I eat a lot trying to forget my problems. B. I cannot lose weight as I combine exercising and eating unhealthy food. C. I have gained weight after changing my habits. D. I would like to lose weight without changing my habits radically. 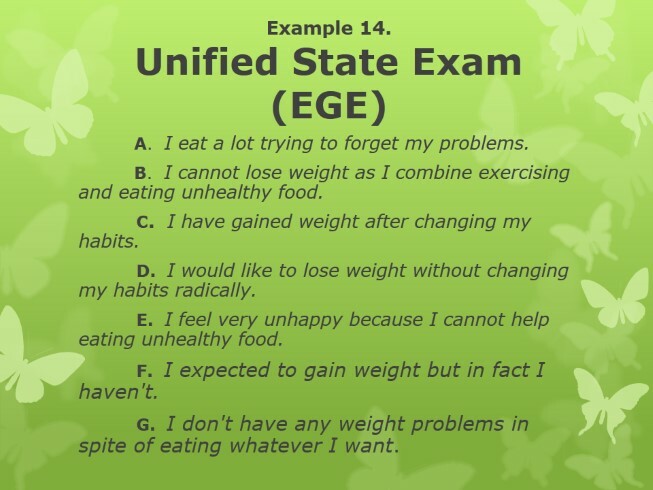 E. I feel very unhappy because I cannot help eating unhealthy food. F. I expected to gain weight but in fact I haven't. G. I don't have any weight problems in spite of eating whatever I want. In tasks A8 - A14 circle the number 1, 2 or 3, corresponding to their chosen answer choice. Again, I'm not sure how this works in any other part of the world. At my university we have a student-elected body of representatives called «The Union». 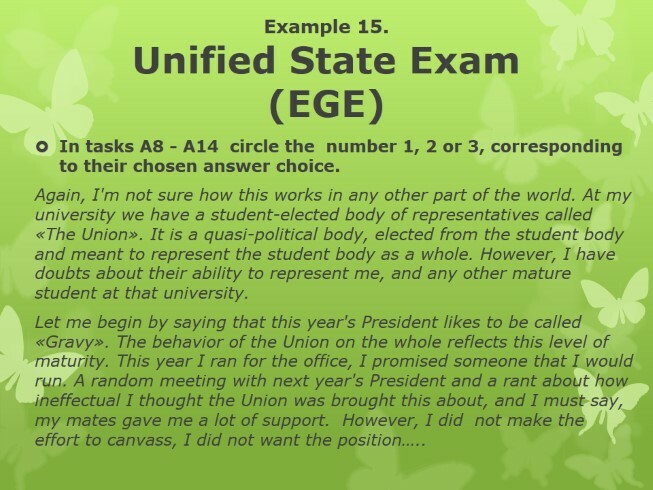 It is a quasi-political body, elected from the student body and meant to represent the student body as a whole. However, I have doubts about their ability to represent me, and any other mature student at that university. Let me begin by saying that this year's President likes to be called «Gravy». The behavior of the Union on the whole reflects this level of maturity. This year I ran for the office, I promised someone that I would run. A random meeting with next year's President and a rant about how ineffectual I thought the Union was brought this about, and I must say, my mates gave me a lot of support. However, I did not make the effort to canvass, I did not want the position…..